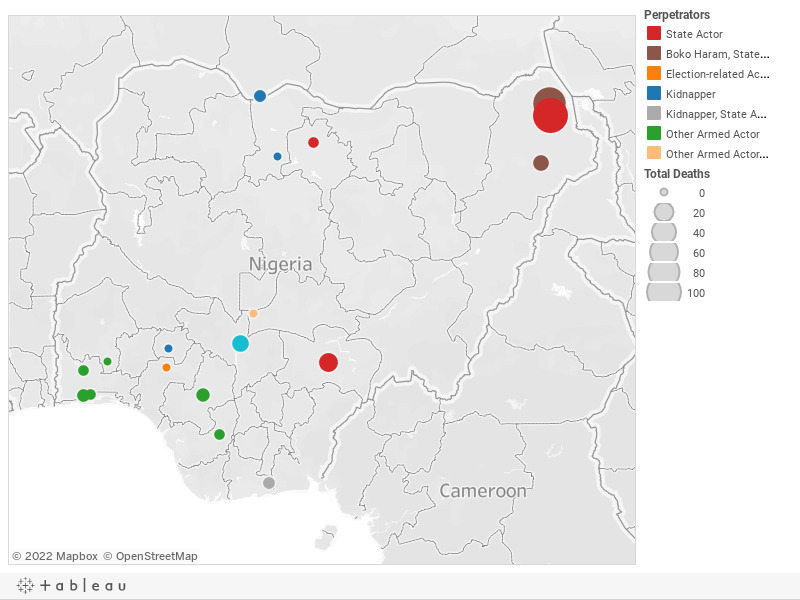 Below is a visualization and description of some of the most significant incidents of political violence in Nigeria from January 5 to 11, 2019. This update also represents violence related to Boko Haram in Cameroon, Chad, and Niger. These incidents will be included in the Nigeria Security Tracker. Over the last eight months, the Nigerian army killed sixteen militants in Benue and one in Nasarawa (no LGA given). January 6: Kidnappers abducted two in Jibia, Katsina. January 7: In a series of "recent operations," Nigerian troops killed one hundred Boko Haram militants in Goniri, Yobe state, and Damasak, Kross Kuawa, and Monguno, Borno state. January 7: Boko Haram killed three in Konduga, Borno; Nigerian soldiers repelled the attack and killed "several" (estimated at five) Boko Haram militants. January 7: Gunmen abducted two in Malumfashi, Katsina. January 7: Gunmen abducted two in Ado Ekiti, Ekiti. January 8: Three were killed during an APC rally in Ikeja, Lagos. January 9: Ten were killed during a communal clash in Bassa, Kogi. January 10: Nigerian troops killed eighty Boko Haram militants and lost two soldiers in Kukawa, Borno.